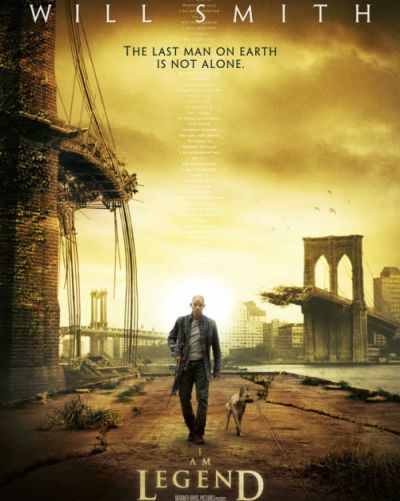 Two days ago I saw I Am Legend, a new post-apocalyptic film that stars Will Smith. This film is loosely based on the same-name science fiction novel which was published in 1954 by Richard Matheson. The plot: A miraculous cure against cancer becomes a global nightmare. The cure evolves into a plague and spreads all over the world and kills or infects 99% of the population in 2009. Less than one percent is immune against the virus but unfortunately for the survivors the infected lurk in the shadows. These vampirish mutants hunger for blood and only come out at night as they react painfully to UV radiation. The movie is set in 2012 and revolves around military virologist Robert Neville (Will Smith) – this guy is one of the only survivors on Earth and he’s desperate to find a cure against the virus. Neville lives in a totally desolated New York and is slowly going mad as he’s completely isolated, his only friend is his dog Sam. I Am Legend is one of the best vampire/zombie/mutant movies I’ve seen in a while. I wasn’t really impressed by vampire movie 30 Days of Night but fortunately I Am Legend is a lot better. The story is pretty interesting and the setting is very amazing, the desolated New York depicted in this movie looks really stunning. The acting in this movie is also very good, it’s all centered around Robert Neville and Will Smith does a perfect job. Back in his “Fresh Prince” days I didn’t really like Smith but I have to admit that he has become a very good actor. Also worth noting is the performance of the German shepherd in this movie, this dog deserves a “Best Canine Performance” award! I Am Legend does have some minor plot holes but overall this flick is definitely worth watching. I give it a 8/10 and I’m considering to read the novel..